Discover the wonderful city of Castries, located on the tiny island of St. Lucia. Surrounded by the best Mother Nature has to offer such as mountains, rainforests, waterfalls, and stunning beaches, not to mention the Caribbean Sea, you will discover that this might just become your favorite port of call, Castries. There is so much to do here, in spite of its size that you can feel assured you will enjoy your visit and we have the Castries Excursions that will help you experience the best of both Castries and the island of St. Lucia. Round trip transportation from your St. Lucia cruise terminal! Air conditioned, fully licensed and insured transportation! All zip line safety equipment included! Canopy Zip Line Course (9 platforms and 8 lines)! One zip line guide for a group of 8 and one nature interpreter! 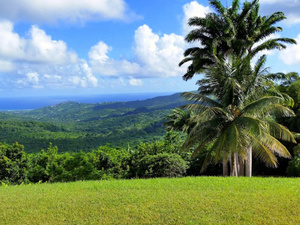 Panoramic views of the Rainforest and North of the Island! Great combo with fun filled tram, trails, and zip line excursion. You will ride an aerial tram for spectacular views of St. Lucia, hike through the lush rainforest on easy walking trails and go high on the Canopy Zip Line Park that has 9 platforms and 8 zip lines. Get a view like never before! Round trip transportation from St. Lucia cruise terminal! 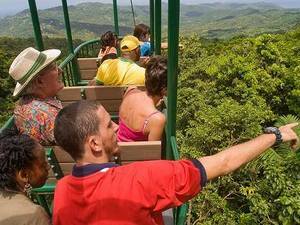 See amazing views from the Aerial Tram on this unique St. Lucia Excursion. You will ride a tram down a mountain in the Castries Waterworks Reserve for some spectacular views! English speaking certified local St. Lucia Shore Excursion guides! 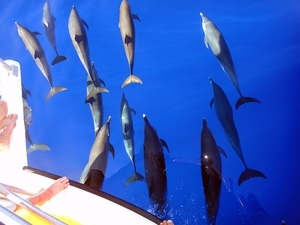 Quiet approach and interaction with the whales and dolphins of St. Lucia island! Complimentary soft drinks, mineral water, light snacks and rum punch at the cruise excursion boat! Small groups so great dolphin and whales views for everyone! Looking for a St. Lucia Excursion adventure in the great outdoors? Then come along with the experienced crew for some whale and dolphin watching off the coast of St. Lucia! 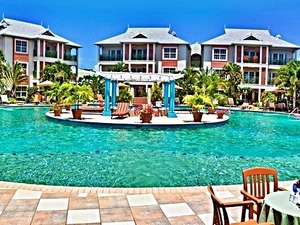 Day pass access to St. Lucia Bay Gardens Beach Resort and SPA! All of the resort amenities such as swimming pools, beach and pool lounge chairs, kids play area and more! Delicious lunch and 4 beverages of your choice! Choice of a massage, use of 2 water sports or half day pass to Splash Island Water Park! Free WiFi in public areas! A day of relaxing, activity and just plain fun at one of St. Lucia's best Beach Resort! Enjoy an exclusive Bay Gardens day pass, great value plus mix-n-match the options for your whole group! Round trip transportation included! Round trip transportation from your St. Lucia cruise ship terminal! 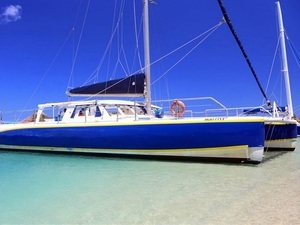 Comfortable, fully licensed and insured catamaran boat ride! English speaking certified captain and guides! Open bar and traditional lunch included! Sightseeing excursion of Soufriere and Diamond Botanical Garden! Choice of mud bath or volcano visit! Stop for swimming or snorkel in the ocean! Enjoy the best St. Lucia Excursion on this full-day sailing! Sightseeing, coastal cruise, rejuvenating mud bath, botanical gardens, swim in the turquoise waters of St. Lucia and more! 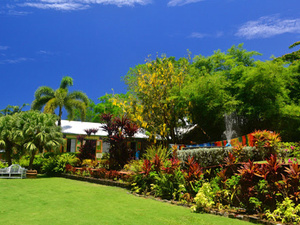 Visit the Howelton Estate and Pigeon Island National Park! Countryside sightseeing including The Morne! Free time to explore the Pigeon Island National Park! Use of the facilities in the National Park - beach chairs, showers, restrooms and changing facilities! 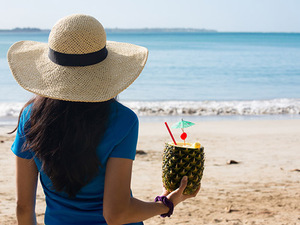 Get the best of St. Lucia in one day! You will sightsee the capital city and hit all of the best highlights. Then you will have time to relax on Pigeon Island! All snorkel equipment including mask, sterilized snorkel tube/mouthpiece, fins and flotation vest (if required)! Guided shore snorkel in Pigeon Island National Park! Free time to explore the National Park! While in St. Lucia spend your day in Pigeon Island National Park. You'll have time to snorkel, spend some time on the beach or if you prefer, hike up the fort. Bring your camera, there is no place like it! Sightseeing of Castries, Canaries and Morne Fortune! Stop at the Horizon View Point and Caribellle Batik! 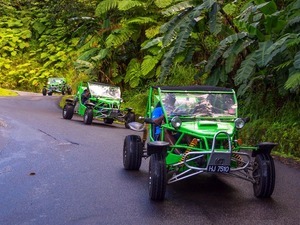 This adventure takes you from the capital of Castries, along the hilly west coast through numerous tiny villages, to view the popular and stunning Pitons. With a stop to glimpse a few local artisans, village life, and some history of the island, you’ll feel like a St. Lucian for a day. Sightseeing of Castries including the Morne! Stop at Howelton Estate and Stony Hill! Complimentary snacks of fresh seasonal fruit! With this excursion, you will satisfy your craving for history, art, tasty treats, shopping and nature. All rolled up into one adventure, we’re sure you’ll put St. Lucia on your list of places to return to soon. Pickup from your St. Lucia cruise ship pier! Certified English speaking staff and guides! Manual or Automatic transmission Buggys! Amazing coastal drive along the west coast of St. Lucia! Photo stops along the way! Visit Toraille Waterfall, Mud Baths (optional), Morne Coubaril Estate! Delicious Local Creole buffet lunch at the Estate! Complimentary beverages (soft drinks, bottled water, rum punch, rum mixes, and beer)! Discover St. Lucia in a different way. Coastal roadway buggy drive. See banana plantations, Toraille Waterfall, Mud Bath, Coubaril Estate and much more! Your adventure continues on board a catamaran that would take you to Anse Cochon for a relaxing beach break. Drinks and lunch are included too! 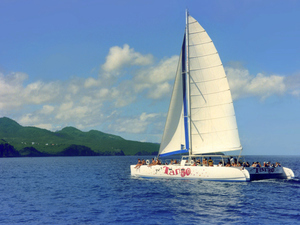 Catamaran sail along the West Coast of St. Lucia! Visit the Morne Coubaril Estate! See Soufriere, Pitons, Drive-In Volcano, and more! Opportunity to add activities at the Estate - Zip Line or Horseback Riding! Beach break at Anse Cochon Beach! All snorkel equipment including mask, sterilized snorkel tube/mouthpiece, and flotation vest! Complimentary beverages on board the catamaran (soft drinks, bottled water, rum punch, rum mixes, and beer)! Taste a little bit of everything. 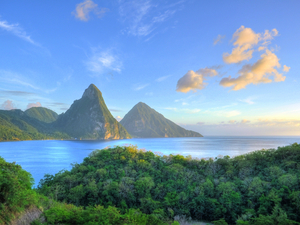 Sail to the west coast of the island to the famous Pitons and visit the Drive-in Volcano. Enjoy lunch at Morne Coubaril Estate. 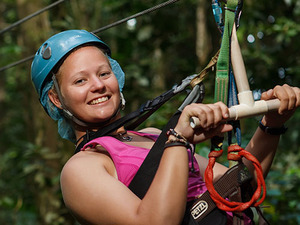 If that is not enough, you can add a zip line or horseback riding adventure to your excursion. There is even a beach break at Anse Cochon beach! Open bar and snacks onboard the catamaran! English speaking certified guide and crew! All zip line and snorkeling safety equipment included! 8 zip lines at Morne Coubaril Estate! Delicious creole lunch at the estate! 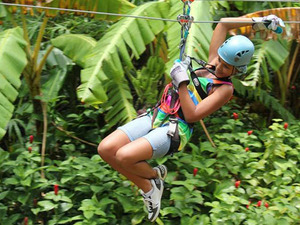 Enjoy an action packed day on this sailing and zip line combo shore excursion in St Lucia. 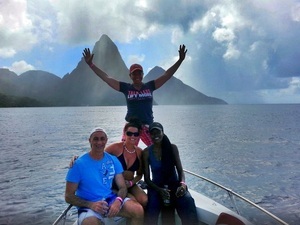 Complimentary traditional Creole lunch at the best location overlooking the Pitons! Catamaran or Power Boat ride! Visit Castries Cathedral, Marigot Bay, mud baths, Toraille Waterfall and other amazing locations! 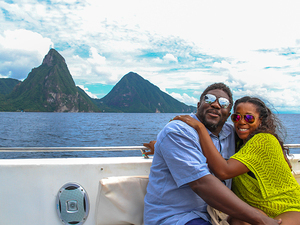 Enjoy an around the island experience on this 360-degree excursion of the best landmarks in St. Lucia. Historical, entertaining and fun for all ages. Land journey and catamaran cruise in the same shore excursion! Professional sport and deep sea fishing equipment! English speaking expert fishing captain and crew! Complimentary beers, soft drinks, mineral waters and light snacks! Fully insured and licensed deep sea fishing excursion boat! 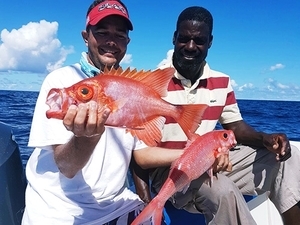 For both beginners and enthusiasts, this great St. Lucia fishing excursion is fun, exciting, and rewarding. You will enjoy 4 hours out on the water, fishing with professional rigs alongside experienced crew members. With a maximum capacity of 8 people, this is also a great way to get away from the cruise crowds! Beverages and traditional Creole lunch included! 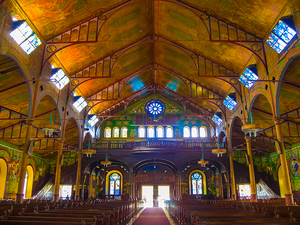 Visit Castries Cathedral, Marigot Bay, and others! This St. Lucia sightseeing shore excursion will visit the remarkable landmarks of Castries City and lunch is also included! A great St. Lucia island introduction excursion combo. Entrance fee to Pigeon Island National Park! Use of beach facilities: freshwater showers, beach chairs, etc! Beer, rum punch, and bottled water! 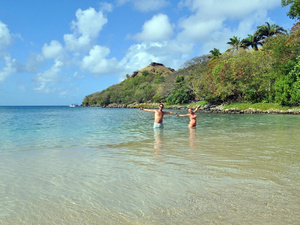 An affordable priced extended stay beach break day pass excursion from St. Lucia, at the beautiful Pigeon Island Beach. R/T transportation, entrance fee and beverages all included for a great beach St. Lucia Excursion. Bar Hopping and stops at Seagrape Beach Bar, Marjorie's Satellite, Prudee's, Auntie Marie's and St. Lucia Yacht Club! All Inclusive on selected alcoholic drinks! Photo opportunities at Vigie Beach, Cas-en-bas, Pigeon Island and Reduit Beach! 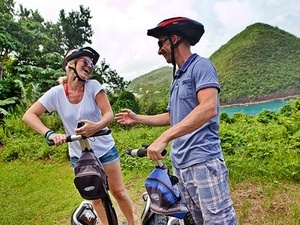 A fun way to sightsee St. Lucia! Are you ready to party? Do you like the beach? Have a great time visiting four different beach bars with a unique local vibe. Let your soul get wild and enjoy the fun! Round trip speedboat transportation from your St. Lucia cruise ship terminal! English speaking certified crew and guide! Snorkeling instructions, and guided snorkel at the base of Piton Mountains! Complimentary cold beverages and snacks! Stop at a secluded beach, Anse L'lvrogne! Small groups only, maximum 20 participants! Escape completely from the crowded cruise ship excursions. You will visit two of the most amazing sites in St. Lucia! You will snorkel at Sugar Beach and then you will visit the mesmerizing Anse L'Ivrogne Beach. Enjoy! English speaking certified Segway guide! Operating instructions and practice session! Exclusive access to private Natural Reserve in Mount Pimard! Safety equipment: helmets, elbow and knee pads! Scenic coastline ride along the rainforest natural trail! Fresh fruit and juice stop! Small group of 20 people maximum! Experience this unique adventure on your Segway X2, off-road machine. You will have the chance to see the northwest coast of St. Lucia and learn not only about the flora and fauna of the island but the history of this beautiful island...and have fun doing it! Canopy Zip Line Course (16 platforms and 8 lines)! Two zip line guides for a group of 8! 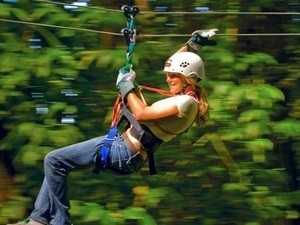 Adrenaline fueled fun in the best that nature has to offer on this Canopy Zip Line Excursion! Experience 16 platforms and 8 lines in the midst of St. Lucia's rainforest and even a Tarzan swing to max out your adventure! English speaking and licensed bottom fishing boat captain and crew! Complimentary soft drinks, cold bottled water and light snacks through the bottom fishing excursion! All necessary bottom fishing equipment - tackle, rods and bait! Assistance throughout the fishing activity if desired! All taxes, fees and local St. Lucia fishing excursion license! Seating, shaded areas and restroom on the fishing boat! 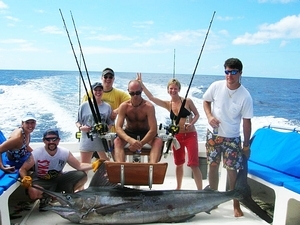 Come along with us for a great bottom fishing St. Lucia Excursion. You will be accompanied by your experienced fishing excursion crew and yes they know the best bottom fishing spots! Great for the entire family/group, no experience required, pure easy fishing fun! Beverages during sightseeing segment (cold bottled water and fruit water)! 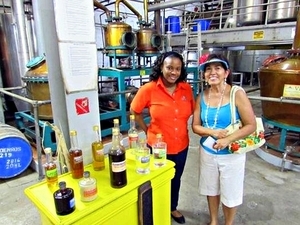 Visit a distillery in St. Lucia and enjoy a rum tasting! Cultural, historical and fun, this St. Lucia shore excursion offers you all! See some of the island highlights including a real sugar cane distillery then enjoy tasting a wide variety of flavored Caribbean rum! 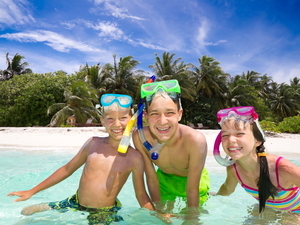 Half or full day beach break day pass option - Splash Island Water Park St. Lucia! Packages that include the famous water park, chef's lunch, beverages and beach chair! Access famous Sea Grapes beachside restaurant and bar! Lifeguard supervised, certified ocean beach water park facilities! 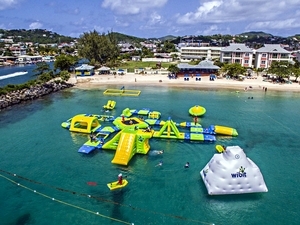 Fun beach day pass at the brand new Splash Island Water Park in Castries St. Lucia. Enjoy this brand new Splash Island Beach Break with Water Park, Chef's Lunch, Beach Chairs and more including round-trip transportation! Round-trip boat ride from your St. Lucia cruise ship terminal! Marine park fee for snorkeling! Drinks offered on board -beer, bottled water and soft drinks! Coastal island shore sightseeing cruise by boat! Coastal boat sightseeing cruise excursion to the North side plus visit to St. Lucia's best beach. Snorkel, swim and taste a delicious creole lunch on the golden sandy Reduit Beach fringed with the turquoise blue Caribbean ocean. 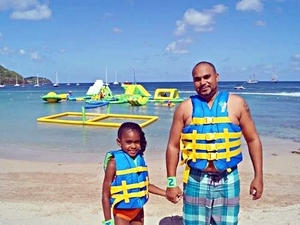 Half or full day pass into St. Lucia Splash Island Water Park! Largest Beach Water Park in St. Lucia and in compliance with strictest of European safety requirements! Water Park is staffed by a team of certified lifeguards! All of the fun activities of the floating ocean beach water park - climbing iceberg, swings, slides, trampoline, walls, rockers, volleyball and more! Great beach and water park day pass for families, children and those who like to have fun in the water! Round trip transportation is included! Half and full day Splash Water Park options available as a Cruise Excursion from St. Lucia! Round trip boat ride from your St. Lucia cruise ship terminal for the sea portion! Air-conditioned, fully licensed and insured transportation for the land portion! Beverages on board the boat! 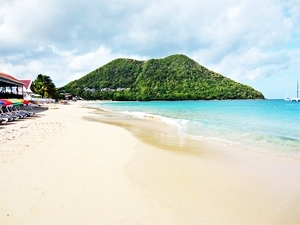 Beach stop at famous St. Lucia Sugar Beach! 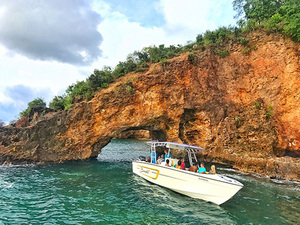 On this private St Lucia cruise excursion by land and sea, enjoy highlights of Marigot Bay, Pitons, Soufriere Volcano, mud baths and waterfall dip plus enjoy time at Sugar Beach with white sand and turquoise water.